These crisp, flaky, buttery pastry Palmiers sound rather fancy, but they're surprisingly simple to make. 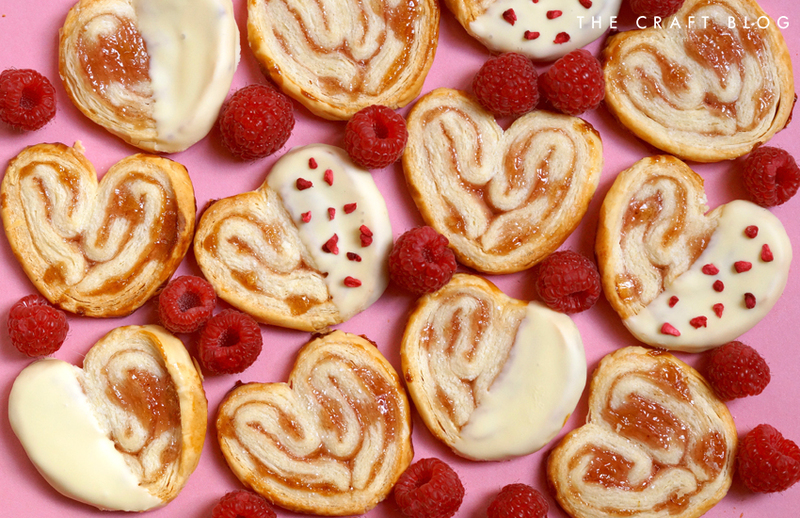 We've put a little twist on the traditional rolled technique and folded the Palmiers to give a more pronounced heart shape for a home-baked Valentine’s day gift or snack. Sweet Palmiers are perfect served with coffee or sandwiched together with ice cream and fresh raspberries for a more substantial dessert. They make a lovely afternoon tea treat too! 1. Pre-heat your oven to 195°C/180°C fan/Gas Mark 6 and then line two baking trays with greaseproof paper. 2. Unfold the puff pastry, keeping it on the paper, so the longest edge is facing parallel towards you and spread 3 tablespoons of the jam over the top of the puff pastry. 3. Fold the left edge of the pastry into the centre using the paper to help lift the pastry and then fold the right edge in to meet the left. 4. Spread the remaining two tablespoons of jam over the top of the pastry and then fold both edges together, like closing a book. 5. Wrap the pastry up in the paper, gently press the seam of the pastry down for a sharp edge. 6. Place the rolled pastry into the freezer for 20 to 30 minutes to firm up so that it's easier to cut. 7. Take the pastry from out of the fridge and then use a sharp knife to cut the pastry. Wipe the blade of the knife with between slices if it starts to stick - aim for around 5mm thick slices. 8. Place each Palmier cut side up on baking tray. They will expand during baking so be sure to leave plenty of space between each Palmier. 9. Dust each Palmier liberally with icing sugar and bake for 20-25 minutes until golden brown. When removing from the oven, allow them to cool before decorating. Palmiers taste great as they are at this stage, but you can add a little extra decoration if you wish. I've dipped a few of mine in melted chocolate and sprinkled over some freeze dried raspberry pieces. For palmier sandwiches simply crush the raspberries in a bowl with the back of a fork then fold through freshly whipped cream, ice cream or cream cheese. Spoon onto a palmier, top with a second and gently squeeze together. You can make your own puff pastry, but it's laborious and there are great brands readily available, just be sure to go for an all butter option. Palmiers are best eaten fresh, but the folded unbaked dough can be stored in the freezer for up to 1 month, just slice off and bake as many as you need. Store the remaining dough in the freezer until needed. Any flavour of jam can used here to replace the raspberry, Nutella would work rather well too! And if your Valentine has less of a sweet tooth why not go for a savoury filling? Grated cheese, chopped nuts and even caramelised onion jam are delicious. How will you decorate Elle’s Valentine’s Palmiers? We’d LOVE to see, so don’t forget to #trimcraft and @elle_jane_ when uploading to social media and to share your yummy makes in the Inspiration area. They really do look yummy!